This intermediate release adds full support for image selection based on GPS metadata to the File Utilities plug-in. The new trigger conditions makes it easy to use GPS metadata ("geotags") to select images for batch processing, for example a batch file management task involving selecting all images taken within 1km of the Eiffel tower after 8PM and copying them to a folder named "Paris by night" can be set-up in a few easy clicks and applied to an entire image collection at the press of a button. 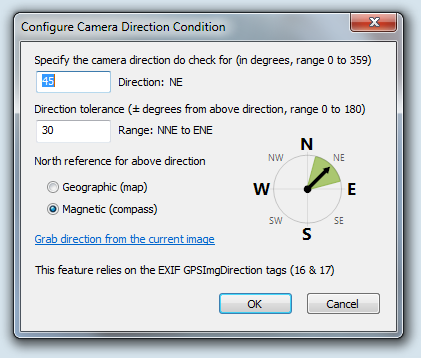 If your camera's built-in or add-on GPS device is equipped with a magnetic compass, like for example Solmeta N2 we used in our internal tests, it is also possible to select images according to the direction of the camera, for example select all images taken towards West (see the GPS direction condition). 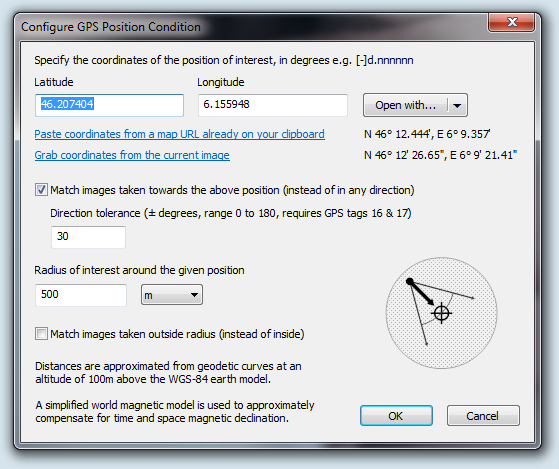 Even better: the GPS position condition can be configured to consider only images taken in the direction of the specified point of interest, with a user-specified angular tolerance and maximum distance. User interface of the newly introduced GPS Position trigger condition, one of five new triggers just added to FastPictureViewer Professional. User interface of the new GPS Position trigger condition. Together with the existing trigger conditions (now 22 in total), the new GPS-based triggers offer an array of image selection criteria not found elsewhere, and made easily accessible through a point and click interface. GPS coordinates can be extracted from the current image or decoded from a Bing, Google or Yahoo! map URL on the clipboard. As a convenience, the user interface let the user launch his browser and open those web-based mapping services on the current coordinates, too. The GPS-based conditions use the WGS-84 earth model for all distance computations. The software knows about magnetic declination according to position and date and will compensate for it when interpreting compass readings. As such, all estimations made when evaluating GPS-related data should be reasonably accurate.